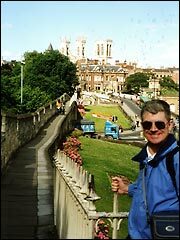 In 2000 we holidayed in Yorkshire; and visited Harrogate, and in Knaresborough toured Mother Shipton's Cave and the castle, while in York we admired The Shambles and the magnificent York Minster. And we enjoyed a steam train ride on the North Yorkshire Moors Railway to Goathland (Aidensfield) in Heartbeat country. 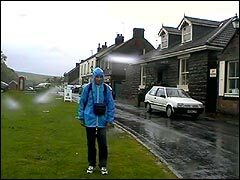 The first picture in the bag - of our Yorkshire holiday cottage for the week at Grafton. We had the living area above the garages of the owner's house. 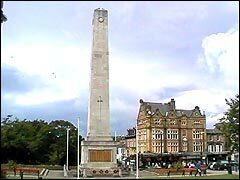 On the first day we went to Harrogate, took a look round and had lunch in a pub before moving on down the road to Knaresborough. On the River Nidd at Knaresborough boats can be hired, but - brrr - unfortunately the Yorkshire weather was far too dull and cold for boating so we headed for Mother Shipton's Cave alongside. 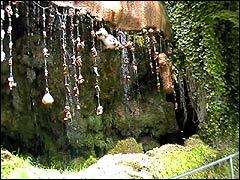 The legend of Mother Shipton can be read on their website (see resources page); this is the enchanting Petrifying Well that turns everyday objects to stone, expertly explained to us by the guide. 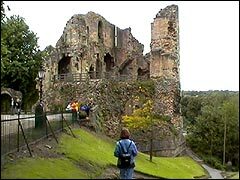 We next headed up to Knaresborough Castle, we didn't enter but explored around the outside and admired the scenic view across the River Nidd from the far side of the castle. It's early morning and Mike's bedraggled already! 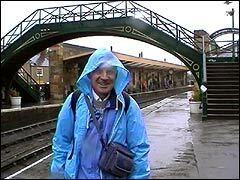 He's on Pickering station doing his bit to camera while waiting in the rain for the North Yorkshire Moors Railway heritage steam train to chuff in. 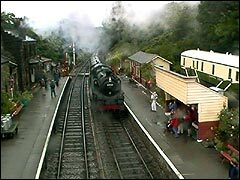 The North Yorkshire Moors Railway runs from Pickering to Goathland - otherwise known as Aidensfield in the TV series 'Heartbeat'. 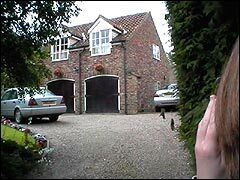 We looked around many of the TV series' sights - in the rain. Unfortunately the small Heartbeat exhibition place was closed so we headed back to Aidensfield, er sorry, Goathland station to catch the North Yorkshire Moors Railway steam train back to Pickering. After the horrendous rain and getting soaked to the skin we returned to the holiday cottage, had a shower and cooked dinner. 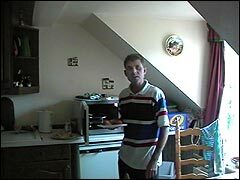 Look carefully and you can see Mike's secret stash of beer! The Yorkshire cottage was just about adequate for two, and following our yummy meal we relaxed with a game of Monopoly which Belinda won... by cheating. Notice the tiny TV on the right. We can't go to Yorkshire without visiting York city, and take in a walk along the medieval wall. 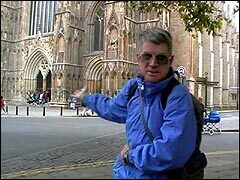 Mike doing another bit to camera (most of these images are video grabs) outside York Minster. We didn't go inside but had a good look around outside. York's notorious for its difficult parking so we took the park and ride which worked out pretty well. This is the centre of York city, in contrast to the previous day the sun was shining which was to be the only day it did all week. We had a lovely jacket potato lunch in a side street pub just here, after which Belinda got lost in a teddy bear shop we passed. 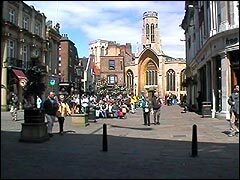 The famous York Shambles. We latched onto a tour group and got the low down on the area. 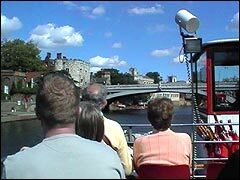 Finally in York we took a boat trip along the River Ouse, with the captain pointing out the city's landmarks with his wonderfully enlightening commentary. 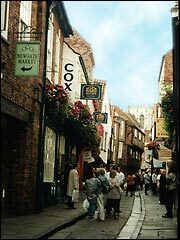 Well we found York definitely worth visiting with its famous Minster, city wall walk and quaint side streets. 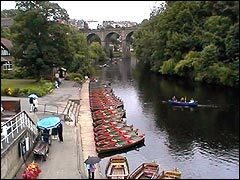 You'll find reviewed website links to the places and areas we visit on our UK tourist resources page, useful if you're planning to visit Yorkshire. On page 2 of our Yorkshire holiday we enjoy some walking in Yorkshire's appealing countryside and return to York to visit a discount shopping outlet. See our Peak District holiday too. Oh, and Salisbury may also be of interest. And our ride on the Welsh Highland Railway.